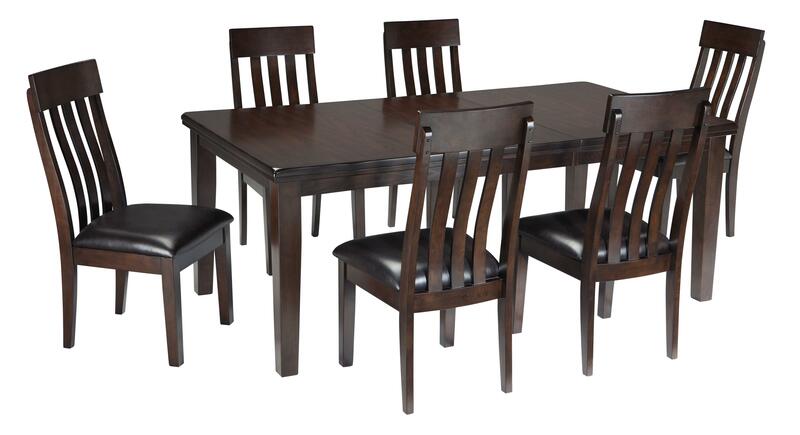 Enjoy your next gathering at this extending dining room table and side chair set. 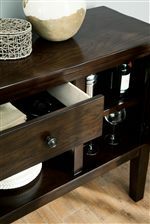 Made with select oak veneers and hardwood solids then finished with a smoky dark brown color, this vintage look will add spice to any dining space. The table features a 18" butterfly leaf that will extend the table from 60.25" to 78.25", with capacity to seat eight with ease. Gather around and take a seat in the slat back upholstered dining side chair. This piece has three wide back slats and lumbar support to ensure comfort. Bring this vintage-inspired look into your home today! 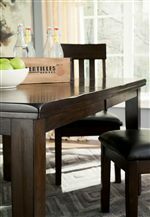 The Haddigan 7-Piece Rectangular Dining Room Table w/ Oak Veneers and Upholstered Dining Side Chair w/ Lumbar Curve Set	by Signature Design by Ashley at Darvin Furniture in the Orland Park, Chicago, IL area. Product availability may vary. Contact us for the most current availability on this product. The Haddigan collection is a great option if you are looking for Relaxed Vintage furniture in the Orland Park, Chicago, IL area. Browse other items in the Haddigan collection from Darvin Furniture in the Orland Park, Chicago, IL area.